Hello there, I had a request to make a video showing what my favourite sentiment stamp sets are. That is what I am here to share today. I am a big fan of sentiment sets, I do have a lot as I like a wide range or styles and sizes. Here are a few of my all time favourites (scroll straight down for the video without the talk). Clearly Besotted have some amazing sentiment sets. They range in different sizes and fonts and are great value for money (as you usually get a lot in each set). My top three sets are A Little Sentimental, Many Mini Messages and Sentimental Type. I think they are my most used stamp sets ever! I adore the fonts on them (all three are different) and I love that they are smaller in size. You can see me use them here, here and here. Next up are some of the larger sentiments. 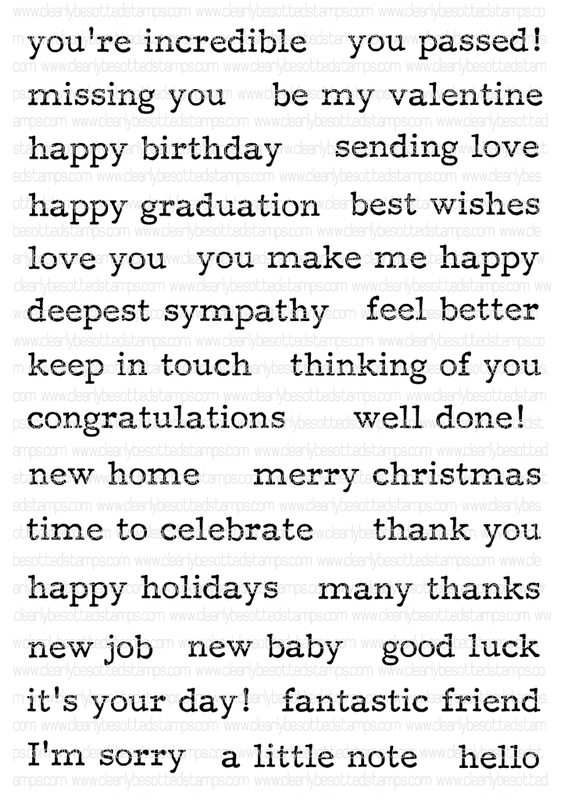 I really like the script font and sizing on the Simon Says Stamp Big Scripty Greetings stamp set. 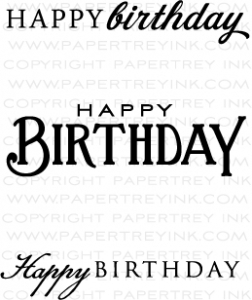 The set has sentiments for different occasions and a good size to use on a card with a background piece. You can see me use it here. The next sets are the Think Big Favorite sets by Papertrey Ink. 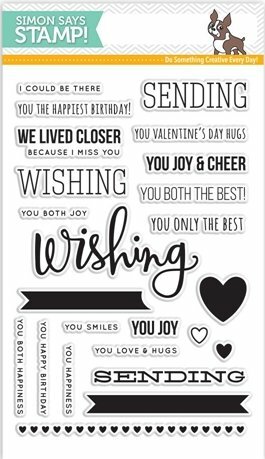 If you want a large sentiment that covers a lot of your card, these are the ones! I love the combination of fonts on a lot of them, they are only $5 each too! You can see an example of me using one here. I love sentiment sets that use different fonts for different words. One great set for that is Fillable Frames by Papertrey Ink. These are on the smaller side so can be used for lots of different designs and I love that there is a variety of occasions covered in the set too. You can see an example here. I also love sets that can be mixed and matched. The Hero Arts Stamp & Cut sets are great for this. I love the larger script font on one word and the smaller, more basic font on the accompanying sentiments. Obviously these could be used separately too. You can see an example using the thanks set here. I couldn't talk about sentiment sets without mentioning a Christmas one. 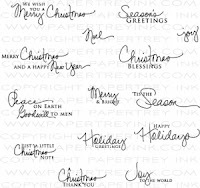 I have used this stamp set, Signature Christmas by Papertrey Ink, numerous times. I love the scripty, handwritten font on certain words. You can see it in use here. To finish off, I have two potential favourites to share with you. I haven't used these yet, as I purchased them not too long ago but they have the potential to become favourites. I love the variety of sizes and fonts in the Simon Says Stamp Sending & Wishing set. The MFT Written In Watercolor set is another set that has larger sentiments in it. I love the watercolour/script font. I am looking forward to using both of these soon. Would you like to win the three Clearly Besotted stamp sets (Many Mini Messages, Sentimental Type and A Little Sentimental) shown? To be in with a chance all you have to do is leave a comment on this post telling me what your favourite sentiment stamp sets are (from any brand, not just from the ones I shared today). The draw will close on Monday 17th August 2015 at 10am BST. The winner will announced shortly afterwards. This is open internationally. GIVEAWAY NOW CLOSED. Here are the links to the stamp sets I shared in the video. Please click on the picture or wording to be taken to where I purchased it. Affiliate links are used on some products. This means that if you make a purchase after clicking on my link, I receive a small commission with no extra cost to you. I truly appreciate your support when using these links. Thank you so much for visiting me today. Have a great day! I like all three of the Clearly Besotted sets. If I had to choose only one, it would be Many Mini Messages. It is loaded with sentiments and I really like the font. Thank you for the chance to win these wonderful stamp sets. Thank you so much, Michelle for the give-away and the chance to win, that's too kind!!! As someone who is just getting started I love all the sentiments you showed in this video. I really like the paper tray ink think big stamps, but also love the clearly besotted stamp sets. I love all the sets you showed! Great video, Michelle...thanks! All of the Clearly Besotted sets are great. Their size makes them perfect for clean and simple cards. My favorite is Many Mini Messages. Ohhhh... I adore sentiment sets. They add the finishing touch on a card - I really enjoy working with the script sentiments as they bring a bit of elegance to any project! Love the ones you have used here. Thanks for the chance. Hi Michelle. I'm so glad you did a post with your favourite sentiments. Mine is from Papertrey Ink, Signature Greetings II, but I love the Clearly Besotted ones as well. In fact I'm always trying to find the ultimate sentiments for my cards! Thank you for the opportunity to win! I really like mixed font sets. I use the sentiments that come on CB Damdelion Dreams set a lot. Thanks for the giveaway - you can never have too many sentiments!!!!! I love the CB stamp sets that you have shown, Michelle! 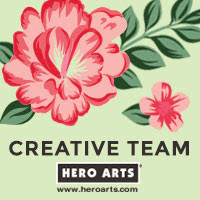 I use the Hero Arts Year Round messages frequently as well as Avery Elle Oh Happy Day. Hello Michelle, I don't own any of the clearly besotted sentiment sets so can I just say thank you very much for including me in the giveaway. I do however own a few clearly besotted stamp sets and use the sentiments that come with those sets - love the quality! I love the MFT written in watercolour you showed - I may just have to save for them. Thanks again, much appreciated. I'd find it hard to choose between "Many Messages" and "Say it in Style", both by Clearly Besotted also. I haven't got any of the 3 smaller sentiment sets in the giveaway so I'd love to win, thanks for the opportunity! Oh my they are all wonderful. If I had to choose it would be the Simon Says Sending & Wishing Stamp Set or the Clearly Besotted Stamps A Little Sentimental. All of the Clearly Besotted are wonderful sets and you get so many in one set. Thanks for sharing. I love sentiments from Lawn Fawn =] They are adorable and they are very punny! Hi Michelle, Thanks for another great video :) My favorite sentiment stamp at the moment is Wplus9's Hand Lettered Hello because I like how it has a scripty hello and then the sentiments are in a sans serif font. They can go together or be used alone. Very simple and elegant. P.S. You are great! Jennifer D.
While I love all the stamps you've shown today, I really like the Paper Smooches 4 x6 Clear Stamps Sentiment Set. i've had a few sets over the years..but my most favourite that has been used more this year than all my other sentiment stamps in earlier years is CB's A Little Sentimental - it's perfect. There are so many sentiment stamps on the market, its great that you've shared you're favourites. I like the large grungy Christmas messages that Lili of the Valley do and I love Paula Pascal stamps too as she mixes a large and small font on some of the sentiments and a good mixture within the stamp sets aswell. I just love the Sweet Little Sentiments by Clearly Besotted. Thank you for the video, very helpful. I smiled when I see the wishing/sending set, I remember watching your Simon haul video about that, you said you talked yourself out of it, and decided to buy it later. I was pretty much the same, I really liked the set when it first came out, but I thought I have so many similar ones I can do without getting new stamps/dies. But after watching your video, I went onto Simon's website, and bought it straight away - I think once you've seen it in real life (sort of), you just want to have it - I'm obsessed, I buy so many and make hardly any cards, and I'm not on any design team whatsoever, lol. Anyway, not an essay, my favourite sentiment sets at the moment are from Clearly Besotted Back to Basic (3 sets). I don't have other bigger sentiment sets. Give me a million pounds, I'll buy more, lol. Keep doing your videos, love them! You have great taste in sentiment stamp sets...I agree with you! My favorite stamps tend to be the "Think Big" sentiments from Papertrey Ink along with the scripty sentiments from Simon Says Stamp. Love them all! I really like many of the Mama Elephant sentiment sets. I also like the Hero arts stamp and cut ones like the one you showed here. My favorite sentiment sets are Hero Arts' Everyday Sayings and Avery Elle's Oh Happy Day! TFS!!! THEY'RE ALL SO BEAUTIFUL IN THEIR OWN WAY! BUT I THINK I LIKE THE PTI SIGNATURE GREETINGS II STAMP SET. I LIKE HOW THE TWO FONTS WORK TOGETHER IN ONE GREETING! I love the Sweet Little Sentiments set from Clearly Besotted. 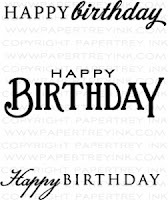 There are sentiments for so many occasions and I absolutely love the font. Thank you so much for sharing your favourite sentiment sets! They are all great and right up my alley! The sentiments I reach for often are the ones from the Winnie & Walter The Big, the Bold ... series as there are so many possibilities to mix and match. Thanks for this awesome giveaway - love these versatile sets! I JUST GOT THE HERO ARTS STAMP AND DIE THAT SAYS HAPPY AND I LOVE IT. I PLAN ON GETTING MORE. I like mixed font sentiments usually, but right now my favourite is the MFT Written in Watercolour set. I can´t say, which one I like the most. They all have wonderful sentiments.I really love them all! first of all congratulations for all the wonderful creations! Well, as to wich sentiment stamps I like, I must confess I am so obsessed with getting pretty stamps that I never bought just sentiment sets. I do like the PTI signature greetings stamp set, though. Wonderful sentiment sets. Currently, I will have to say the My Favorite Things, Written in Watercolor, set is my favorite. Not just because it's the only one I own, but I just think it is so pretty. Thanks for showcasing all your sets, and your beautiful cards, and taking the time to make a video. i too am a lover of sentiment stamp sets and my current favourite is Paper Smooches Sentiment Sampler. I love the quirky font of the words they use. I think my second favourite is the Personal Impressions Paula Pascual Mixed Sentiments set. but I also love the CB sentiments stamps - i'm saving up for some of those. Great video love all the stamp sets but do like scripts ones best. Thank you for sharing your favorite sentiment sets! I only own one set, so I guess it is my favorite by default. :) I actually love it quite a lot. It's a set by Simon Says Stamp called Handwritten Borders. Thanks for giving us all the chance to win some goodies! Thanks for the chance to win, love them all. I don't have a personal favorite sentiment set as I haven't purchased one that has been my go to set. However of the three posted, mini messages has a TON that I would use very often! I'm like many of the commenters... can never have enough sentiment sets! I don't have any of the Clearly Besotted brand yet, but seeing the three above makes me put them on my wish list! I have lot of these on my wish list.. but i agree PTI is so much value for money. I love the Simon says stamps banner greetings and PTI signature greetings. The watercolored bold set from MFT is so on my list.. I love such bold sets!! Thank you for sharing!! Love love your videos!! It is so hard to choose, but I do like My Favorite Things, I probably have more sentiments from them than any other company. Would love to ink up these that you have available. Thanks for the chance to win! I only own a few SU sentiment stamp sets but I have been shopping around form more. I like a larger font and some of the snarky ones :) My favorite is MFT Written In Watercolor. Papertrey Ink has a couple of very small sentiment sets, ideal for small spaces. Right now the Tim Holtz Crazy Talk set is on my wish list - to go with my Crazy Birds! Right now my favorite sentiment set is from MFT Written in Watercolor. I do like smaller words though, as they fit not nicely on to most cards. Thanks. Love sentiments and can never have too many! TFS!! These may need to be on my wishlist!! I am really looking for a good set at this time I only one from SU. I also like sentiment stamps...the more the better. Then you have a wider variety of ones to pick from. I recently purchased the Big Scripty Greetings from SSS (Love them). I mostly have Stampin Up stamps (one of my favorites for years) but am branching out. Thank you for the opportunity to find other's. Blessings! I love sentiment stamps....and these DO look great. I don't have any of these yet but I am sure I will be picking up a few. I like Many Mini Messages because of all the possibilities. I like the MFT Written in Watercolor set. On list of things to get! I have never seen the Clearly Besoted stamps before your video. I do like sentiment stamps. Don't really have a favorite cuz I don't keep the packaging. I do like SSS ones. Thanks for a chance to win! Thank you for the chance to win. I don't have a favorite sentiment stamp. I use whatever fits with my card. I do tend to use sentiments that have a mixed size and font look to them. So glad you posted this info. Just yesterday I was thinking that I needed to look for additional word stamps. I will add all of these to my wish list. 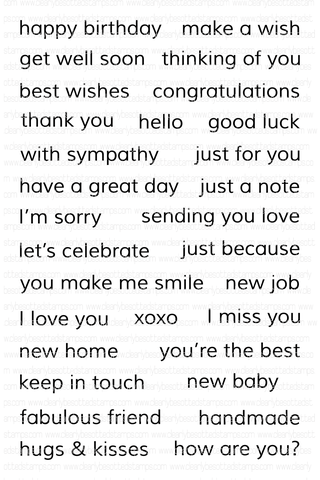 I don't have many large word stamps, so the Simon Says Big Scripty Greetings is a new favorite. I love PTI's Wet Paint, Mama Elephant's True Friend, and Altenew's Sentiments & Quotes :) The ones you listed are awesome! I love the many mini messages stamp. I dont have any at the moment and have been searching for some. I need something that is well worth the cost. As i cant afford to buy many. I think this will be the one i get first. Thank you for the chance to win. This is such a generous giveaway! Good luck to all! I liked seeing the Clearly Besotted. Your blog is informative and fun! Thank you for doing a video on your favorite sentiment stamp sets, I tend to purchase stamp sets/sentiment sets that are versatile, however I still find myself always searching for the perfect sentiment to put on my cards. 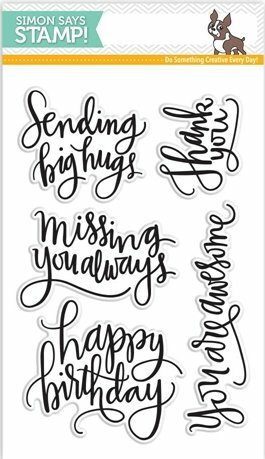 I have been dying to get the Many Mini Messages stamp set from Clearly Besotted, unfortunately every time I get the money to be able to purchase it, it is out of stock. So hopefully I will be the lucky winner :) Thank you so much for your generous giveaway! 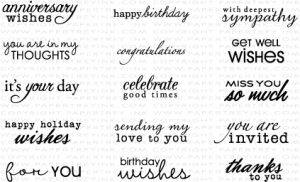 It always seems like each set of sentiments stamps has a phrase that I have or wouldn't use. I wish we could just make our own or select a set with just the phrases we want. Dream On, right? I like those like the MFT written in watercolor stamp set. I wish that there were more stamps made that could be used for the inside of a card. How about sets that includes phrases for the outside AND the inside. That would be great!! 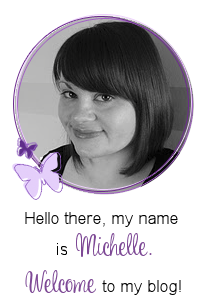 Thank you so much for sharing your faves with us, and for your generous giveaway, Michelle! My fave is the PTI think BIG favorites...so versatile and perfect for my needs! Have a great day ~ Thanks again! Hi Michelle! Great blog post and video! Thank you so much for the opportunity! Unfortunately I don't remembert the make but one of my favorite sentiment stamps is a set I bought full of inspirational quotes and verses. I use them all of the time in the insides of my cards. They add a little more than the traditional sentiments on the front. My current are: "Handwritten Greetings" by SSS, "Extra Grand Sentiments" and "Large Fancy Sentiments" both by JustRite, and pretty much anything that looks handwritten or brush lettered. I'm DYING to try the new MFT set!! Great post, and thanks soooo much for the generous giveaway!! I don't really have a bunch of sentiment stamps- but I have one that says Dream Big- and I love the script of it. Plan to use it more. Thank you for the chance at this give away. Wonderful post highlighting sentiments. My favorites are from Hero Arts, Simon Says Stamp, Papertrey Ink, WPlus 9, Penny Black and Clearly Besotted. This was a good idea Muchelle. I don't have a lot of sentiment only sets, I do have the Clearly Besotted A Little Sentimental and For Everyone though. I think I would like to get a few brush script style sets. I absolutely love the SSS Big Scripty Greeting stamp set the most. I love how large and pretty the sentiments are! Love your cards! I have lots of inspiration now to CASE a few of them, for myself! Thank you! 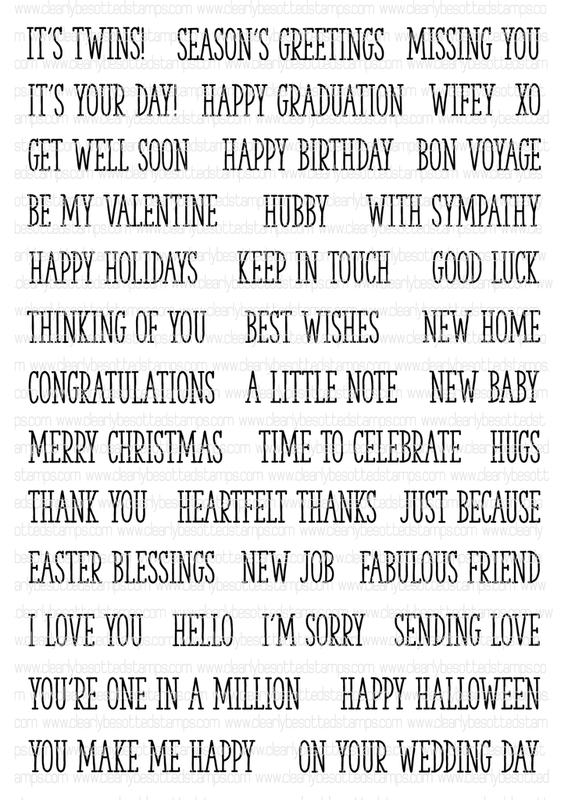 i love using big greetings from MFT. Michelle, you and I have the same taste for sentiments. I have all the sentiments you have except for the ones from Clearly Besotted. It would be awesome to have the chance to win them. They look really awesome. This is so incredibly helpful! I've been a scrapbooker for years and spared my husband the cost of stamps. Until a few months ago! I am new to stamping, but I find this so helpful. I was just looking for a set that could cover a wide variety..
My favourite sentiment stamp set I've got is from clearly besotted and it's called 'sweet little sentiments' the font is lovely and I just love the squiggle! I've even bought the word dies which is a lot larger but same font, thanks for giving us the chance to win! I love all the sentiment stamp sets you showed. I tend to not buy them, but now I need them more often as I'm making more cards. Thanks so much for the lovely giveaway! You can never have enough sentiment stamps. It's difficult to choose, but my favorite sentiment stamp set is the Clearly Besotted Most Wonderful stamp set. I love not just the messages, but the variety of the font styles. I can see why these are some of your favorite sentiment sets. You are such an enabler. I haven't seen many of these sets before. I've added quite a few to my wish list. :) One of my go-to sentiment sets is MFT's Simply Fabulous Sayings. I adore the font and the different sized sentiments. Sentiments are such an important piece to a card. Thank you for this opportunity to win the awesome sentiment sets. I love that the Many Mini Messages has all capital letters. The simple and clean look of the Sentimental Type set and A Little Sentimental set is fantastic....so many versatile sayings! I only have a couple Clearly Besotted sets...both are image sets with a few lovely sentiments. These would make lovely additions. Thanks again for your generosity and introduction to some wonderful sentiment sets. I only have odds and ends of sentiments. Wish I had a "set" I could recommend. My favourite has to be Papertrey Ink. It's a shame they do not have a store in the UK. The delivery and customs charges are crippling! My favorite sentiment stamps seem to change with my mood...however, at the moment feeling a little sassy with my card making, I really love "say it how it is" by Dyan Reaveley:) thanks for the awesome chance to win! I don't have a favourite sentiment set yet - I'm still just a beginner stamper really. But maybe these stamps could become favourites?! Thanks for the opportunity! Some of my favorite sentiment stamps are from Unity stamp co. I like the unique messages found in their stamps. Great post, btw! :) I'm a new sub! Of those you highlighted, I like the Clearly Besotted A Little Sentimeltal as well as the MFT Written in Watercolor (or whatever that was!). I probably need to check out the Christmas set since it is fast approaching!